Hop aboard and enjoy all of the fun together, because when you buy one cruise fare, Royal Caribbean will give you another 50% off. Plus Wi-Fi… perfect for holiday bragging! Also, sailings from the UK included gratuities. Offer ends 6th May. New bookings on eligible sailings only. T&Cs apply. Choose from 26 world-class ships, and from our wide range of unforgettable excursions and get ready for all the epic thrills and tranquil chills awaiting your arrival. So what are you waiting for? This is how to holiday. T&Cs apply. There’s never been a better time to book a holiday than today. Take your pick from 26 world-class ships and 249 spectacular destinations including their very own private island in the Caribbean, CocoCay! Not to mention the unforgettable excursions awaiting your arrival, simply decide whether you want epic thrills or tranquil chills. There’s something for everyone. 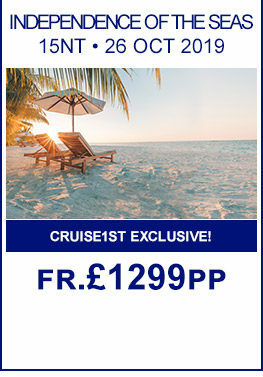 Smash a deal on this one and book your adventure cruise with Royal Caribbean Cruises. Sail to stunning worldwide destinations, from tropical & exotic itineraries to ancient and historic cities, enjoy everything the Royal Caribbean fleet have to offer onboard. Be served by Robots in a Bionic Bar, surf the waves on the FloRider, climb the rock-wall or indulge in some 'me time' in the luxurious Spa. There is truly something for the whole family, so take a look at the offers below or use the search box top left and find your ideal Royal Caribbean cruise holiday today! 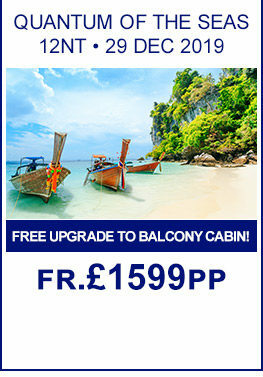 All offers are on selected sailings and are subject to availability. £0 deposit is only applicable if customers sign up to a monthly direct debit payment schedule at the time of booking. 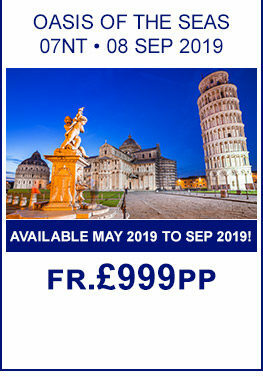 The £0 deposit offer is only available on the following sailings: All Ex UK sailings for 2019 and 2020 (excluding any Ex UK or fly/cruiseline package sailings with P&O, Princess and Cunard) and selected fly/cruise 2020 sailings. 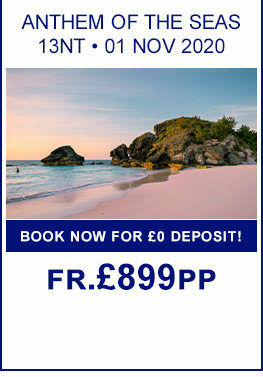 Minimum spend to qualify for £0 deposit applies - £1,198 per booking. £0 deposit applies to cruise line retail packages, additional flight deposits or payments may apply on Cruise1st.co.uk package bookings. OUR BEST ROYAL CARIBBEAN DEALS! Many other dates Available from May to September 2019! FREE New York City Stay! FREE Hotel Stay In Miami! Includes 3nt Los Angeles Stay! Includes 3 Night 4* Las Vegas Stay , Includes New Orleans Stay! Includes Singapore City Hotel Stay! Includes 2 Night Sydney Stay! Includes FREE Orlando Stay! , Superb Transatlantic Itinerary! Includes a 7nts Niagara Falls Tour! Why not climb mountains at sea, ice skate on the equator, or sunbathe past glaciers? Royal Caribbean have pushed the boundaries of imagination and innovation to bring you the world's first onboard rock walls, ice-skating rinks and surf parks. On a cruise holiday you're free to do as much or as little as you like. With more than 290 destinations, breathtaking shore excursions and amazing onboard innovations at every turn, you can experience a cruise holiday like no other. Watch our video and see what Royal Caribbean has to offer!